Minnesota Vikings wide receiver Cordarrelle Patterson was big factor in Minnesota’s 34-6 win last Sunday versus the St. Louis Rams. Patterson had 176 total yards and scored a TD on a 67-yard run. While Patterson only had three receptions for 26 yards, the wide receiver took three handoffs and gained a total of 102 yards rushing, leading the team in that category. Patterson’s 102 yards on only three rushing attempts was historic. It was only the second time in the NFL (since 1960) that a player rushed for 100 or more yards on three or fewer rushing attempts. It was also only the fourth time in the league that a player had 100-plus rushing yards with less than five carries. Here’s a look at the four players who have gained 100 or more yards rushing with five or fewer rushing attempts in a game. 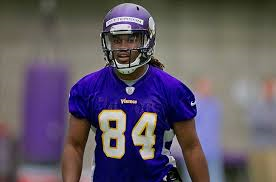 Sept. 7, 2014: Cordarrelle Patterson, Minnesota, 102 yards on three carries. December 12, 2010: Rashad Jennings, Jacksonville, 109 yards on five carries. October 1, 2000: Brian Mitchell, Philadelphia, 105 yards on two carries. December 5, 1971: Essex Johnson, Cincinnati, 109 yards on four carries. * Patterson was the first receiver to join this group; the other three players are running backs. * All four players above scored a TD in that game. * Two of the four played their game at home (Jennings and Mitchell). * Patterson is the youngest to accomplish this feat.